Hair removal is something most women have to deal with on a pretty frequent basis. While a lot start off with waxing at salons, eventually, they realise that hair-removing at home with the use of epilators are much faster and more convenient. Not to mention, it’s much cheaper and quicker when you can carry out the whole process yourself! A small device that plucks out hair strands right from the root with the help of tiny tweezers made out of metal or ceramic, which rotate, grab the hair strands and pull them out; epilation has been able to leave skin beautifully smooth for several weeks, not days! Especially handy for working women or mothers, epilators have become a gift, that saves the time, money and effort, of women, with minimum risks involved and hairless, smooth skin when the times calls. Panasonic is a very well-respected name in the technology sector. 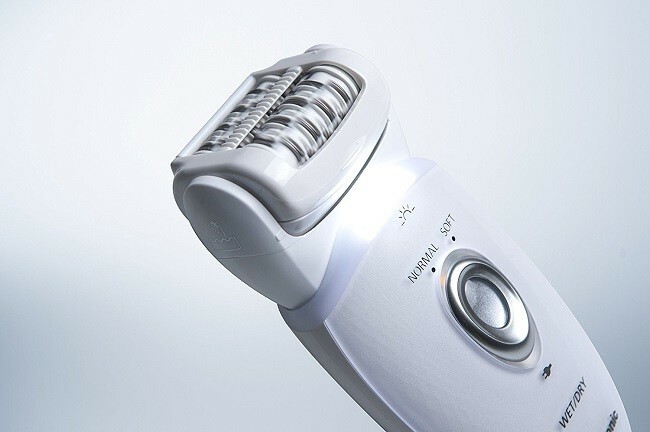 Founded in 1918 by a man named Konosuke Matsushita, Panasonic has been producing some of the best consumer beauty products around, and with this wet and dry cordless epilator, they deliver the kind of positive product experience they are renowned for. This Panasonic ES-ED53 Wet and Dry double-disc epilating device protects your skin with a special skin protector, so that only the hair is pulled out, not the skin. This makes for long-lasting smoothness that can be acquired with minimal discomfort and skin protection. 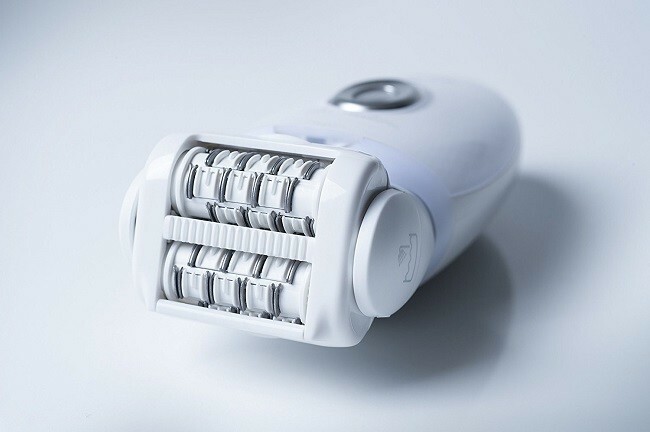 The two inbuilt discs in the epilator for hair removal combine forces with the 48 tweezers, which never directly come in contact with the skin, in this device, to leave your skin smoother for longer. The great thing about this epilator is that it can show great results even with extremely sensitive skin, and around the bikini line. This device comes accompanied by four additional attachments, so that you can carry out your hair removal routine in the bath as well as the shower, with equal ease or opt for a dry epilation, as well, with the ES-ED53. These attachments help you with those “hard-to-reach” spots on your arms, legs and bikini area, and provide you with a gentle and comfortable experience that never neglects the care of your skin. 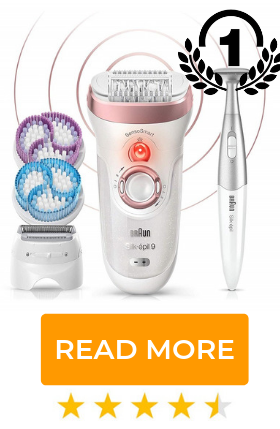 The flexible pivoting head that this epilator comes with works “with” the body instead of “against” it; it slides smoothly along the curves and contours of the body for effective epilation that lasts long and leaves the skin velvety smooth. Always double-check! The LED light on this epilation device helps you shed light on your skin to ensure you haven’t accidentally overlooked a patch or a few stray hairs. The better you can see what you’re doing, the more thorough the epilation. To clean your epilator, all you have to do is hold it under running water. Easy and hygienic maintenance can extend the life of the product and is a largely fuss-free affair. It’s only natural to be a little apprehensive about using a new product, especially if this is the first time you are using an epilator. The instructional manual that comes with the device is full of practical and useful tips on epilating and the device itself comes with two different settings, “normal” and “gentle”, so you can ease yourself into this new hair removal method. Is The Panasonic ES-ED53 Wet and Dry Worth The Money? Women who have been using epilators for years vouch for this high-quality product, which is reflected in Panasonic ES-ED53 reviews online. Being able to use it in both, the bath and shower, and having so many options to customise your hair removal experience with, has definitely come as a pleasant surprise to most women. Plus, it’s superior efficiency is only rivalled by the markets best epilators. 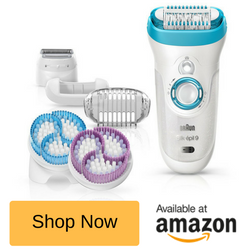 Not only is this epilator reported to be much quieter than other wet and dry cordless ones, the rotating head has received much praise for making the whole process much easier, as a whole. 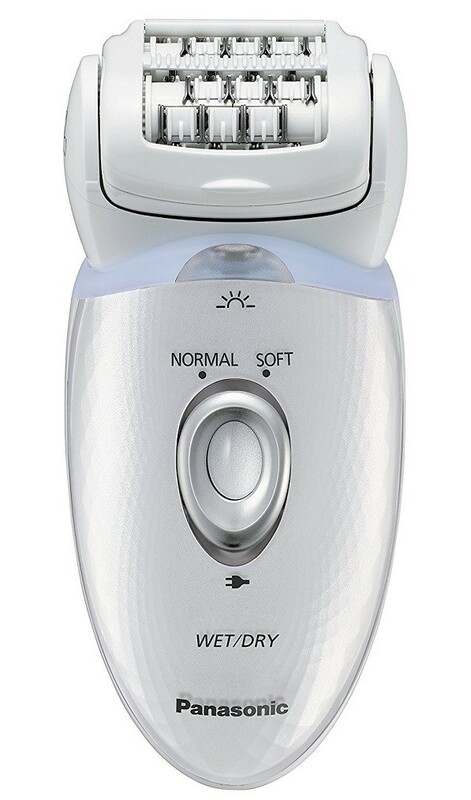 Its price tag is another aspect in which the Panasonic Wet and Dry Cordless Epilator leaves a mark; thanks to the kind of features it offers, this purchase would be pure value for money. Not only does this quality epilator protect the skin with its Gentle Skin Guard, while ensuring that the actual hair removal is as gentle and pain-free as possible, the Panasonic ES-ED53 Wet and Dry Epilator comes with four different attachments (shaver beard, bikini comb, skin guard and length shield) that let you customise your own experience according to your own preference. 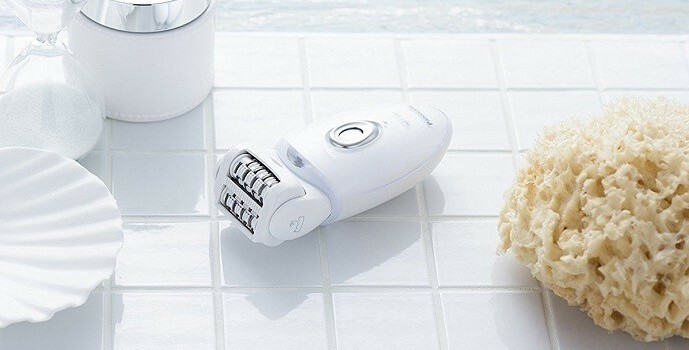 Whether to epilate dry, or in the bath or shower, this epilator lets you make the call and trusts that you know what’s best for your own hair removal routine. This device is robustly built, with a handful of features aimed at making it easy to use and comfortable; the 60-degree flexible head, for instance, can rotate and move in accordance with the natural curves and contours of your body to ensure you never “miss a spot”. Using a moisturising body wash, soap or foam before epilating is always a good idea so that your skin isn’t too dry. 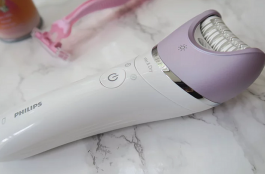 You can squirt some moisturising shower gel or cream onto the spinning epilator head to help it effortlessly glide over your skin – and no, this won’t cause hairs to slip, as the gripping mechanism is so strong.